A short review below of this book. I am going to enjoy, I think, reading more Bolano. He seems to be the sort of writer I was getting at in my Anti-writing post. I do not like those communities of artistic people who are talk and tinkle. I believe the world needs action from good being. Literature is indeed a valid pleasure for its own sake. But there are conservative, reactionary, and, I would say, bad folk out there who put ‘Art’ above life and politics. Surely it can be as much a retreat and sanctuary as anything, but to suggest it as a self-sufficient entity that represents some sort of suprahuman state seems to me to be deeply dangerous. I thought this very good. It’s my first encounter with this writer, and although I have seen reviews suggesting his ‘difficulty’, I have no hesitation in recommending this to anybody. (I thank Mike Puma for suggesting it as probably the most suitable introduction to the author). It’s very rich and dense, with startling images and cross-cutting motifs; many extra-textual references too, but I hardly think they matter at this stage. Later, I will return to read the book again, as one will return to a film, looking forward to the total experience, reading differently, with more prepared resonance as a reader. Here I’ll reveal what struck me immediately. The single paragraph of the novel (well, there’s two if you include the seven word paragraph at the end, important as it is) is the confessional of a Priest/Poet/Aesthete/Critic who believes he’s dying. He isn’t – except of course, he is, as we all are. He’s not a sympathetic character, what with his being a coward, a debauch, a hero worshipper, a solipsistic fool (just to begin the catalogue). But he is sympathetic too for the poor man is just anyone. I’m not convinced that this is remotely a book about Chile, despite the confessor’s search for the very Christian, very Chilean, I think a reader who goes in fangs bared knowing this Priest is member of (fashionably, what else, negatively connoted) Opus Dei or intuiting that he was part of the establishment that crushed the brave Socialist experiment will miss much of what is actually in the text. That’s something ironic, something of the the world of the lovers of literature and the arts generally, that something being you don’t approach act and being as a political animal by chattering about representations. There are the precisely controlled traces, just enough, of the horrors of Chile – and, incidentally, Europe and the USA – to help embrace a certain readership into necessary active political studies of the nature of myths , narratives of gods, nations, good and evil, left and right, personal identity. Even Pinochet – who has a speaking part in this novel (during one of the Priest’s six stories) understands that to defeat a story you meed to understand it. Bolano, though, goes deeper, and suggests that if you scratch away at any story an utter boredom, acidie, ruination and decay are revealed. Again, here, the reader who knows knows about relating to personalities at a much more positive level (by contrast): the lecher priest who feels Pinochet’s hand upon his knee like a myriad desiring multitude of hands; the frightened priest who sees in a namesake baby with eyes and mouth closed himself against the world (while, in this moment also rushing with heterosexual desire) knows nothing of health: for him the world is in ruins, and broken and unstable as much of the imagery of the novel explores. It’s useful to have priest-aesthete as narrator. For one thing, such an individual has the ideological permission to be above the mere world of the messily human, and Sebastian (the priest) assumes such permission (as many do do). His torpor (mere boredom) in Chile is followed by aesthetic excitatation springing from one part of Europe to another. In a hymn to his God he praises not the Lord’s justice or concern for the oppressed but his own being graced by encounter with “my happiness, passion regained, genuine devotion, my prayers rising up and up through the crowds to the realm of pure music, to what for want of a better name we call the choir of angels, a non-human space but undoubtedly the only imaginable space we humans can truly inhabit, an uninhabitable space but the only one worth inhabiting, a space in which we will cease to be but the only space in which we can be what we truly are…” My guess is that there are priest-aesthetes spouting this all over the world in various forms. There may have been refined monsters in Auschwitz sharing sherries with their local clergy who hissed it too. 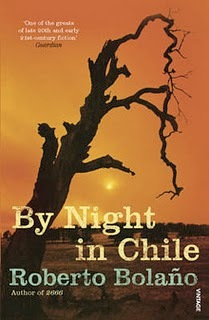 This particular failed poet longs for a more ‘cultured’ ‘Chile’. He immerses himself in Graeco-Roman ‘culture’ (clean as a sculpture, and neatly forgetting Aristotle’s – and later Aquinas’ – emphasis upon the political centrality of being); he longs for ‘his’ country to open itself to Whitman, Pound, Eliot, Hugo, Borges, Tolstoy (what a truly bizarre conglomerate! ); he wilfully, proudly, separates himself from the universe of political events (the real people’s acting and being), and regularly joins the grotesque gatherings of third-rate literati, artists and such that chatter in comfortable soirees while beneath them in the basements of a house whose labyrinthine corridors are laid our ‘like a crossword puzzle’, victims of torture suffer and die. But he’s no more a coward than anyone who lives like that. Anywhere, any time. The failure of aestheticism to complete and identity is the torment of this narrator. It is universal. He’s allowed limited reflection himself, for instance awareness of his own own poems’ division into apollonian and dionysian (such a division, of course, being about as creative, active, poetic as a crossword clue), Where the insistent filmic image of ‘zooming’ in through the petals of a flower, through the entrance to the Emperor’s room through door after door of antechambers, to the ‘tunnel of time, back into time’s great meat-grinder’ (the latter near the end) there’s a redemptive possibility, that the frightened story-maker and conservative adult will recognise the wizened youth within and eschew both.